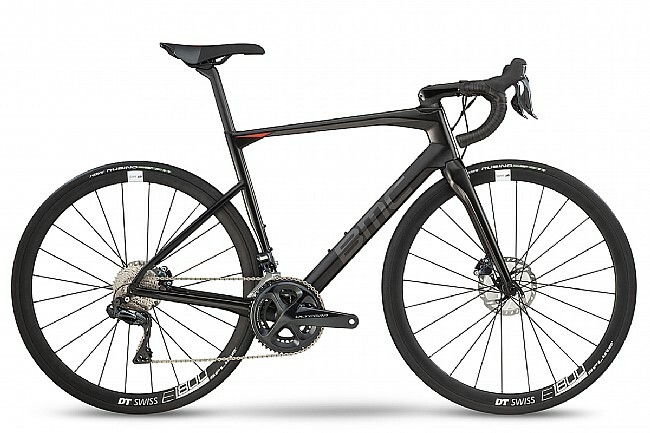 The 2019 Roadmachine 02 ONE Ultegra Di2 Road Bike from BMC is a light, fast, and efficient road bike featuring a carbon frame and fork, fatigue-fighting Angle Compliance Technology, and DT Swiss E1800 SPLINE db 32 rims. Fork: Roadmachine 02 Carbon, TCC Endurance Flat Mount, 12x100mm thru-axle. Headset: Tapered steerer 1-1/8” to 1-1/2”, 51mm offset. Shifters: Shimano Ultegra Di2, Hydraulic. Front Derailleur: Shimano Ultegra Di2. Rear Derailleur: Shimano Ultegra Di2. Brakeset: Shimano Ultegra Di2, SM-RT800 Rotors (160 /140). Handlebar: BMC RAB 02, ergo top shape, compact bend. Stem: BMC ICS 01 - w/ computer and camera mount. Saddle: Selle Royal 2075 HRN. Seatpost: Roadmachine 01 "D" Premium Carbon, 15mm offset. Rims: DT Swiss E1800 SPLINE db 32. Hubs: DT Swiss E1800 SPLINE db 32, Thru Axle (12mm). Tires: Vittoria Rubino Pro, 28mm.